We’re going to the moon…of Jupiter, Europa! 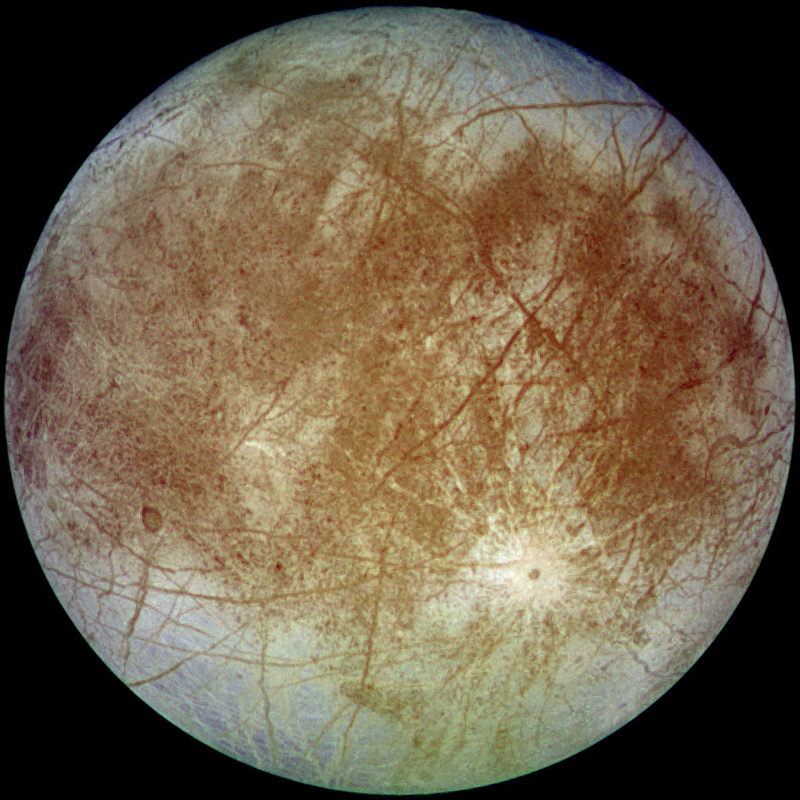 Europa as seen by the NASA Galileo spacecraft on September 7, 1996. New legislation from Congress has approved NASA’s 2016 fiscal year budget of $19.2 billion with a special $175 million designated as a “Jupiter Europa clipper mission” with a target launch date of 2022-2023. The budget proposal stipulates that, “This mission shall include an orbiter with a lander that will include competitively selected instruments and that funds shall be used to finalize the mission design concept.” In other words, it’s against the law to fly the mission to Europa without a lander. Europa was originally selected as a candidate to Due to the surface composition of Europa (primarily water-ice with some silicate rock), the clipper mission will orbit the moon’s surface several times to determine the best landing spot. 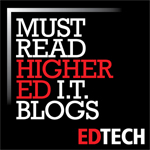 For more information on the Europa Clipper project, check out this article from Ars Technica. For more on details about the Europa mission, check out the mission site from NASA’s Jet Propulsion Laboratory. 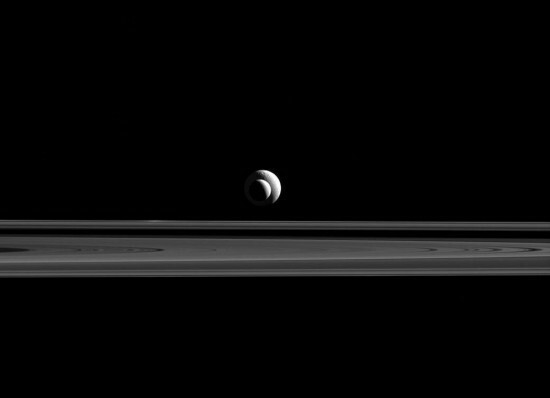 The Cassini-Huygens mission to the Saturn system sent back an image showing the moons Enceladus and Tethys lined up almost perfectly with the probe’s cameras. According to NASA, since the two moons are not only aligned, but also at relatively similar distances from Cassini, the apparent sizes in this image are a good approximation of the relative sizes of Enceladus (313 miles or 504 kilometers across) and Tethys (660 miles or 1,062 kilometers across). For more information on the Cassini-Huygens mission, click here. For more pictures from this missions, check out the Cassini Imaging Team’s homepage. New Horizons’ Best View of Pluto is now here. NASA has just released the highest resolution photographs of the surface of Pluto from the New Horizons flyby (see video above). The images were taken about 10,000 miles (17,000 kilometers) above the surface of Pluto, just 15 minutes before the spacecraft’s closest approach. As seen on Open Culture’s website today, the official music video for DJ Boogie Belgique’s song Ms. Yutani was posted since it features footage from post-WWII Tokyo (seen above). All of the footage is showing pedestrians, commuters, and shoppers going about their day. Although the video was uploaded to YouTube over three years ago, it has gained recognition in the digital humanities community recently in order to pinpoint when this footage was taken. Although there are some military vehicles passing through some of the footage, there aren’t any visible traces of the occupation mainly due to the demands of the American censors who were known for frowning upon direct American references.